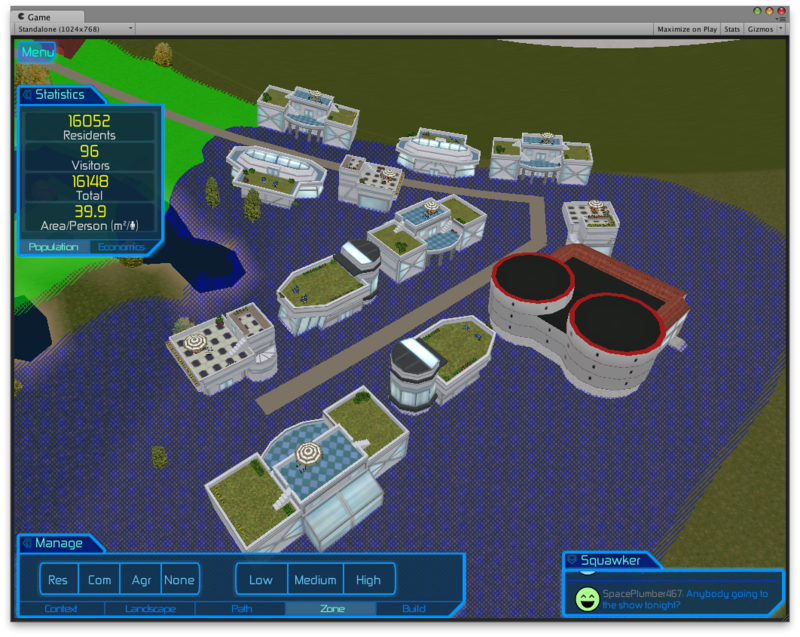 The focus of this release is on getting buildings in city mode. 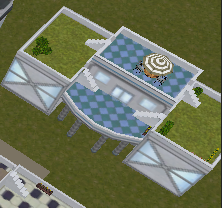 After you’ve painted some zones and laid some paths, appropriate buildings should automatically sprout up as your colony population grows. 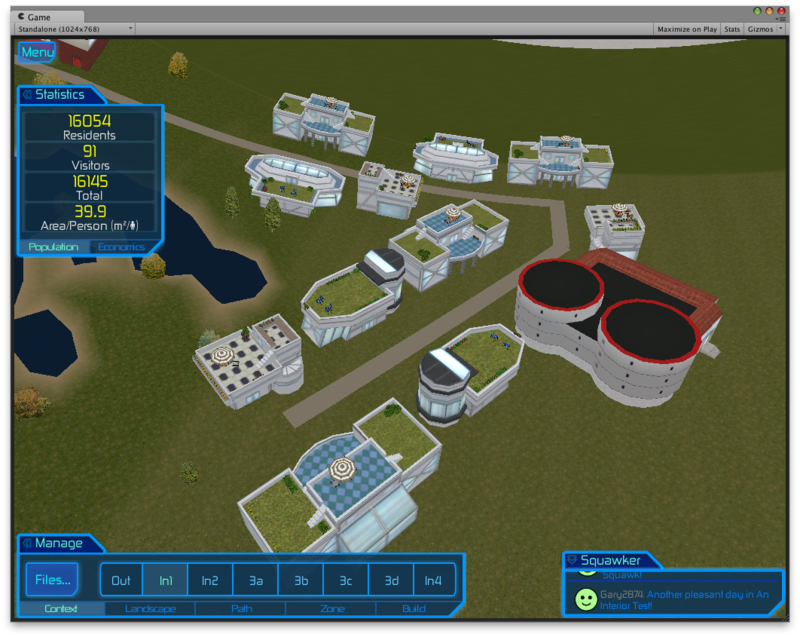 We have this working now with residential buildings, including five different buildings, with several variations of each. The conceit is that the builders in the colony have a relatively limited number of floor plans, but the inhabitants like to decorate their houses (and other buildings) with different accents — patio tables, chairs, plants, gardens, and so on. The image above shows a low-density residential neighborhood that was grown automatically by the building algorithm, except for the police station (that red-trimmed building — we’re still finalizing the texture for that one), which you place manually. Note how the houses were fit in nicely, with only a little bit of space in between, and they all face the walking path. Here’s a view of the same neighborhood, but in Zone mode, so you can see the zones. Blue is residential, green is agricultural, and red is commercial. In addition to these three zone types, we also have three densities you can define: low, medium, and high. These are indicated by different patterns of the zone color: simple diagonal stripes for low density, cross-hatching for medium density, and solid color for high, as shown below. Check out the red (commercial) zones in this image — we have low-density commercial on the left, near the house; medium-density commercial where the path turns a corner; and high-density commercial in the upper middle area. 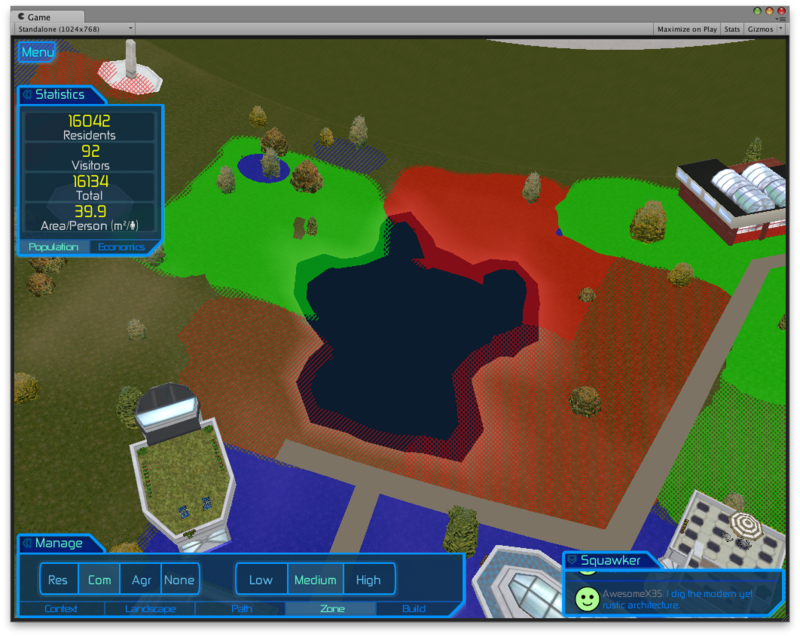 These densities don’t currently affect the buildings chosen, because we simply don’t have enough different types of buildings yet. In fact 0.13 is delayed mainly because we’re still waiting on the first set of commercial and agricultural buildings. But our artists are working hard, and it’s better to be a little late with a good result, than to rush things and produce something sloppy. We’re currently expecting to get 0.13 out early next week, and you’ll finally be able to start growing your space city! The progress is awesome. Congrats on the kickstarter. I’ve posted a link to your site with the Space Opera group on Facebook.